I was invited to an online jewelry party for Origami Owl. I am a huge lover of jewelry so I was excited to see the offerings. You can create your own Living Locket and personalize it with charms, plates and dangles of things that are important to you. There are so many beautiful choices - family, faith, causes, celebrations, hobbies, sports, etc. I chose to create a locket in memory of my mother. I chose a plate that says mom. For the charms I chose her birthstone which is May, an angel, and a heart with wings. I also chose a guardian angel dangle. All on a beautiful Rolo chain. 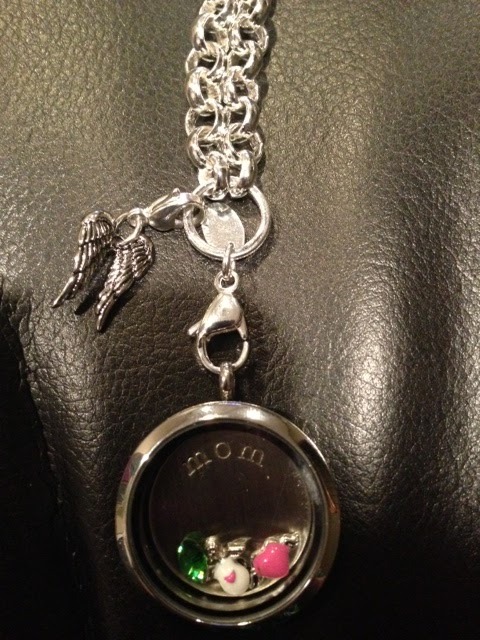 The items come beautifully packaged and it is very easy to open the locket and add the plate and charms. I have to say that I was pleasantly surprised with how lovely this jewelry is. I would highly recommend this product if you are a fan of personalized jewelry. If you are interested in more information or in hosting a party, please let me know and I will put you in touch with Kristen Bergman, Independent Designer. Thank you to Rebecca Ann Mount-Nieto for hosting this party. Great review! I had never heard of them before. I like how you can choose so many different charms for your locket. Thanks for sharing this. What a beautiful locket! Thanks fir sharing with us.